The stage musical genre has crossed paths with popular music on a few occasions over the last 30 or so years. When that inter-mingling of styles occurs, it is often met with praise and varying degrees of success. Mamma Mia, from Abba, was a resounding success on Broadway and as a touring show. American Idiot, by Green Day, was also a success, albeit a more subdued one; finding most of its acclaim as a tour after a short Broadway run. 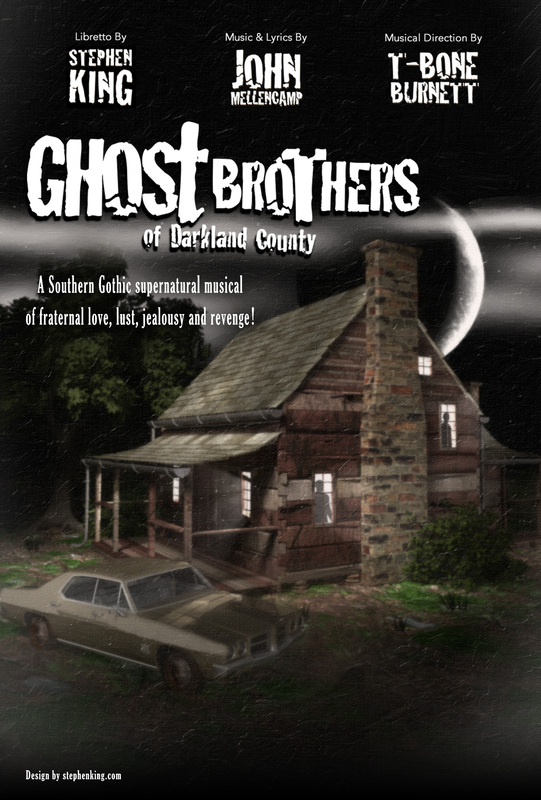 The Ghost Brothers of Darkland County is the latest entry into the world of stage musical by an artist, or artists, known more for their work on other types of stages. Which artists have taken the leap into the world of Broadway theatre now? 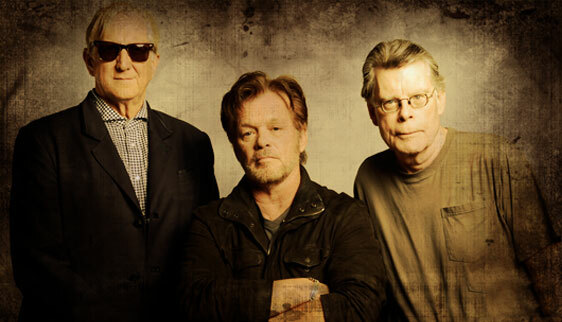 Stephen King, John Mellencamp, and T Bone Burnett. These three men; King, Mellencamp and Burnett, have combined their distinctive talents to venture into a world where none of them can claim any past experience or success. The show has just begun a national tour that will cover 20 dates coast to coast. On November 14th the show made its 4th stop in Durham, NC at the wonderful Durham Performing Arts Center. When the curtain opens at DPAC, the cast was met with a nearly packed house that was curious to see what King, Mellencamp, and Burnett had done. The story, as written by the master of the genre, Stephen King, is full of emotion that rarely, if ever, transitions to anything even close to “happy.” The story is full of anger, hatred, remorse, sadness, and ultimately vengeance. When I walked into the theatre and got my first look at the stage I knew that this show was different. On stage there was a single old style microphone on a stand, front and center, with a spotlight shining down on it. There did not appear to be any tradition set pieces at all; merely a semi-circle of older style wooden folding chairs. To the left was a section of the stage set up with instruments waiting for musicians to pick them up and put them to work. To the right was a table with a set of common items that were to be used to produce specific sound effects to add to the story. There was a backdrop hanging from floor to ceiling at the back of the stage with the image of a creepy looking old shack of some kind. Overall, a truly minimalist approach to a set design that was very reminiscent of a 1940s radio broadcast studio. As the show started my initial thoughts of, “this is different” were immediately affirmed. A harsh red light blanketed the stage as Jake La Botz performed the opening number, It’s Me. Drastic swings in the light design took the place of set changes. The ghosts were always bathed in a heavy white light with the living were all drenched in sepia tint that aged them. Once the music starts, you find yourself on an emotional roller coaster of a story that takes you up and down and pays off at the end with a set of twists that will leave you with a nearly dislocated jaw. Each set of brothers would hit you with lines and lyrics filled with high energy based in anger and hatred. Each of the female characters would bring you emotionally down with songs and lines riddled with such depression and despair. To balance the angst and dreariness, The Shape and The Zydeco Cowboy would interject unexpected laughs in the middle of it all. The cast itself was also a bit of a roller coaster when it comes to their individual talents and how they were used. Billy Burke and Gina Gershon are both powerhouses on stage when comes to delivering the emotions of their respective characters; Joe and Monique McCandless. But, they are also, clearly, not stage singers. Neither of them delivers a musical performance that is going to make you want to cover your ears to spare them from harm, but they are also not anything you will look back on and think of as something noteworthy. A similar, albeit reversed, statement can be said for each set of brothers in the story; Drake and Frank McCandless (Joe Tippett and Lucas Kavner) and Andy and Jack McCandless, (Travis Smith and Peter Albrink). These four men all deliver solid performances vocally in song, but their spoken elements often come off as insignificant. Where the cast gathers steam is in the supporting cast members. Kylie Brown, who plays Anna Wicklow, delivers a vocal performance in A Rose for Poor Anna that will make you sit up in your seat and listen. Jake La Botz as The Shape is dynamic in the way he takes over the stage and in the dark gravely vocals that he pairs perfectly with his songs It’s Me and Lounging Around Heaven. The absolute strongest performer has to be Eric Moore, who plays Dan Coker. His soulful solo, Burn This Cabin Down, at the end of Act 1 completely steals the show. The trio of unique talents that is King, Mellencamp, and Burnett have created a story, a story-telling style, and music that is different and refreshing. They have started out on a venture that could possibly open them up to new avenues to showcase their individual talents. Is this show going to garner any of them even a sniff at a Tony Award? Not even close. What it will get them is night after night of packed houses of audiences that walk out of various theatres impressed by and shocked at what they have just experienced.